Yeah, well…point taken. I was never in that category, but I’m now in a new rare group: forty-something women who go out in public to buy comics. I get a variety of stares when I do this, from the quizzical to the pitiful. Because so many comic book stores have come and gone in my time (I counted six different locations in the last fifteen years or so) I buy my comics now at the local Hastings. They have a decent selection, a nice back-issue collection, and they actually stock more than one copy of Previews. They also have the book side, so I figured I would see more women my age indulging in comics. Eh, not so much. Yesterday I had the latest Wonder Woman and a copy of Non-Sport Update in my hands as I perused all the new “John Carter of Mars” spin-offs when I saw her: she was about my age, maybe a few years older. She was between the Captain America aprons and the first rack of back issues when we locked gazes; I smiled in recognition of a fellow comics fan. She gave me a once-over as if she were preparing to describe me to police later, and rushed off to herd her daughter away from the stoner t-shirt section. The John Wayne commemorative cup she clutched in a death grip should have been a clue, I guess. The thing is, comic books have been around for a long time, and some people don’t see them as just a distraction for the kids. They’re part of a satisfying life for fans, and those fans will get older. More of them these days are women. Passers-by may think being a comic fan or a D&D fan or a anime fan is creepy after a certain age, but we still feel sixteen on the inside. So if you see a middle-aged, goofy-looking woman slowly browsing comics, remember this: I’m not after your kids. 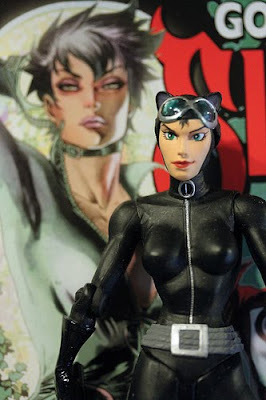 I just want the latest issue of Catwoman.